Sadly he is often remembered for a saying he never uttered – “there’s a sucker born every minute.” This was a slur spread by rivals who hated his success. He was the consummate con artist, it is true. But he saw his job as pleasing people by his scams. I want to say “Amen and Amen.” I love magicians, I love circuses, and I love weirdoes of all stripes. My maternal great-grandfather was a trapeze artist. I come by this love honestly. If you do not adore carnies, you are missing something. 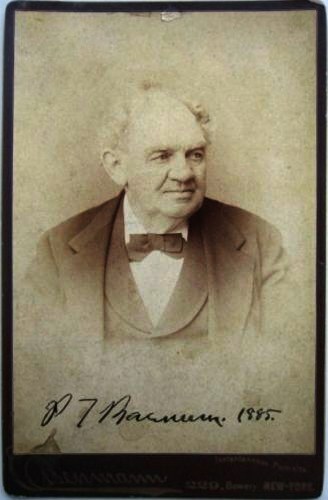 Barnum is remembered for many things: his tour of Europe with General Tom Thumb (when he was introduced to many crowned heads), his exhibition of the “Feejee Mermaid” (an exhibit described as “a creature with the head of a monkey and the tail of a fish”), and other such absurdities. But here is the thing – yes, he wanted to make a buck; but he wanted to please people. I can think of worse crimes. For me his greatest success was introducing Jenny Lind (the Swedish Nightingale) to the public in the U.S. She captured hearts with her breathtaking soprano. Can you imagine? He contracted with her for 150 performances at $1,000 per night? She ended up being so successful, care of Barnum’s tireless promotion, that she renegotiated for more money. She then devoted almost all of her income to the care and education of poor and orphaned children in Sweden. So, to honor Barnum here is a hoax dish. It involves my much beloved tripe, but has no tripe in it. In a large bowl, whisk the eggs, season with salt and pepper and add the oregano. In your omelet pan, cook 1 tablespoon of the butter until it foams and subsides. Pour ¼ of the egg mixture into the pan and cook until it has solidified and is easily slid from the pan, about 2 minutes. Repeat this procedure 3 times with the remaining butter and egg mixture, setting each omelet aside to cool. When the omelets are cool, cut each into ¼ inch thick strips. In a medium, heavy-bottomed saucepan, combine the tomato sauce and the hot pepper and bring to a boil, then reduce heat to a simmer. Add the egg strips and simmer for 10 minutes. Serve over pasta. I suggest shells or bowties, but do what you want. Have plenty of grated cheese for a flourish.